Want to add a subtle touch of color to your spring garden? These Pastel Mix Triumph Tulips are soft and romantic, adding just the right hues to your landscape. 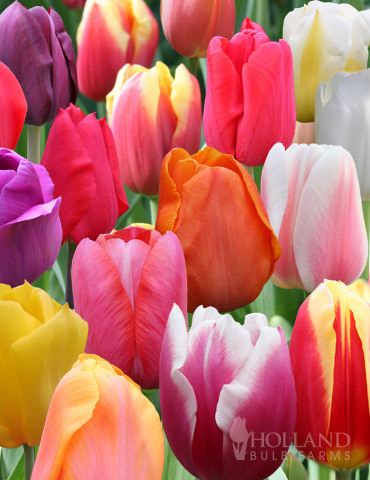 Great for mass plantings and tucking in between perennials, these tulips are sure to bring you spring joy! My previous experience with other vendors has led me to expect that when I order a large number of bulbs that at least a few will be damaged or undersized: that was not the case here. Every one of the bulbs that arrived was a good size and in very good shape. I feel confident ordering bulbs from Holland bulb farms in the future. I felt like I got a real good deal on the tulip bulbs, and I love tulips and I love good deals! I've planted them in Zone 7 here and the ones close to the house are coming up! We had that cold blast and I planted the others deeper down, so they are slower to come up, but so far, great! Holland Bulbs are growing while I await the spring every winter. They never disappoint. Price is always right and the quality is superb!